Do you experience difficulties with the process of window cleaning around your property? Your struggles are not enough to cleanse stains, water streaks and dirt from glass surfaces? The experts of window cleaning in Finsbury will help you out! Say farewell to the countless hours of polishing and wiping – the skilled and experienced team members will handle this problem. You will be able to enjoy your free time – just let us do this slow and tedious task for you. Our professional approach will grant you lots of benefits. We also provide our professional services in nearby areas: Southwark, Bermondsey, Bankside, Surrey Quays, Spitalfields. 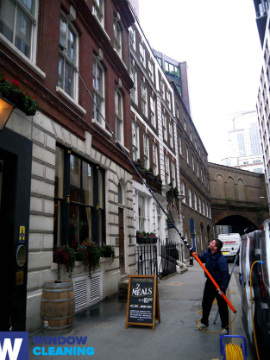 Improve the look of your building – the specialists of commercial window cleaning will deal with that. As part of our specific service, we use water-fed extension poles. With this approach, we can clean completely the windows of your office, as high as the fourth floor. In order to reach higher windows we use rope access. We guarantee your glass panes will look pristine, regardless the high of the building. With the help of the team of professionals London's skyline shall never be dusty. You can always rely on our workmanship and dedication for private and business window cleaning. Our experience allows us to clean all types of glass surfaces you could possibly have at your property. For example, you can apply for cleaning of single or double windows, French doors, sash windows, patio doors and bay windows. Moreover, we include conservatories and skylights as part of our routine. So to speak, you can enjoy the good look of your windows with our prompt and trustworthy services. The experts of window cleaning use sophisticated strategies for the procedure of washing and polishing your glass surfaces, roof windows and conservatories. Our water-fed extension pole technique allows us to reach as high as the fourth floor. The pole is connected to a water supply in the van, removing the probability of damage to the exterior of your building. We also use jet washing as part of our window cleaning service. You can also take advantage of these advanced routines. Use our window cleaning in Finsbury for your house. We will use previously mentioned methods – water fed extension pole system for lower windows and rope access tools for taller buildings. For the whole service we use purified water. Book today – dial 020 3746 3113 and get in touch with our customer care. You also have to option to fill in our on-site booking form or use our chat option.